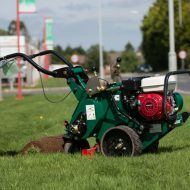 The Pedestrian lawn scarifier is perfect for breaking up cores as well as detaching lawns, greens and tees. Scarifiers will also remove broad leaf weeds and moss in gardens. when used in conjunction with a lawn spiker it is possible to rejuvenate lawns tired lawns.